Years ago when I was a landscape designer one of my biggest turn-offs were customers who requested the “No Maintenance Garden”. Unfortunately, it was most of them, but finally it appears as though times are changing and people are becoming more aware of the benefits of a natural landscape. No successful garden that includes living things can truly be no maintenance, but there will be occasions where, left to its own devices, the garden can take care of itself if you let it. Verbena bonariensis, a tender perennial that has reseeded throughout my garden. Particularly now is the time in the garden, if not overly manicured, where the magic of the reseed can occur. It is not always easy to tell weed from wanted plant, but by not obsessing over unexpected growth, your garden can renew itself naturally. 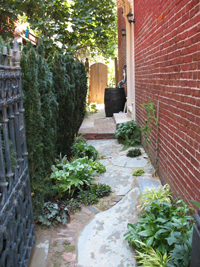 Especially opportune are areas including brick and open stonework as well as regions of gravel. 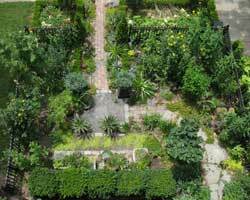 These include walkways that homeowners hope to keep the most tidy, but the bottom line is that many plants do best in coarse terrain. We work so hard to create the perfect fertile ground in our garden, but in nature plants often grow where the seed is able to anchor in one spot, collect water and be properly drained and not necessarily in the area of perfect soil. Purple Salvia lyrata reseeded at left on the walkway's edge. So do let seedlings grow, but don’t ignore the garden altogether either. If you watch your seedlings as they grow (and perhaps even document them), you will be able to identify friend from foe in the future. For example, in my urban garden, I have less possible intruders than a less cultivated area and I am able to pinpoint the most likely intruders; porcelain vine, Virginia creeper, Boston and English Ivy and sweet autumn clematis who all come from one neighbor. Now that I know what their immature foliage looks like, I can nab them before they take root. There will always be surprises too, that make this exercise of will worthwhile. As mentioned in a previous post, I have an accidental pumpkin vine growing in my walkway and I discovered a surprisingly large tomato plant in my, as of yet, undeveloped (to put it mildly) back yard. The tomato has tons of fruit and I am looking forward to a late summer harvest shortly! For the past 20+ years gardening has been an integral part of my life. 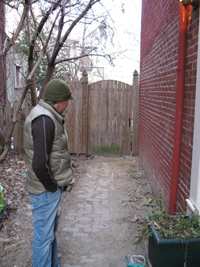 15 of those I have lived in Baltimore, Maryland and it was only in 2007 that I acquired my first yard. So, how did I do it before then? -Well, any way that I could. This post is an explanation of my beginnings as an urban gardener and a tribute to those who, against all odds, battle the concrete jungle to create a patch of green. My first urban garden started atop the roof of a building on Antique Row in downtown Baltimore. I rented a (top) third floor apartment, which was shorter in depth than the two stories below, allowing me to step out of my bathroom window onto the second floor. I was in graduate school at the time and, to support myself, I worked at Garland’s Garden Center in Catonsville, just west of Baltimore. My first plant was a Sedum ‘Autumn Joy’. It was a perfect specimen and I just had to have it (I know- such a common plant- I was young). The Sedum was soon followed by a small holly and a pine and so the roof garden began. As more plants accumulated, I built wooden containers from discarded pallets found at the garden center. What amassed wasn’t so much of a garden, but rather than an assemblage of plants that I really liked. There wasn’t a design to my garden, but I do admit to moving plants around from time to time into different arrangements that I deemed suitable. I even managed to create a watering “system” where I suspended a hose from the kitchen sink and out a window that sat caddy corner to my collection of plants. The major disadvantage of my roof garden was the roof itself. It was black tar and on really hot days it would get so warm that the containers would sink into the surface and leave cookie-cutter like impressions. Years later I moved to a place with a yard, but unfortunately the landlords objected to my manipulating any portion of their lawn. At this point I had completed my studies and had become Nursery Manager at the garden center. A colleague and friend of mine at the store understood my predicament and, also wanting a garden of her own, convinced me to apply with her for a community garden plot in Baltimore city. The waiting list was daunting, but with some good fortune things opened up more quickly than we had expected and shortly had our own green spaces. We had to pay a yearly fee to “rent” the land, but it was nothing compared to what we got in return. I inherited grapes and asparagus from a previous tenant and, in turn, I added ornamental and edible plants along with some wooden columns from my parent’s recently sold farm in Pennsylvania. Jane (my coworker) and I took our gardens very seriously and in future years we were each given Awards of Aesthetic Appeal by Judges in the Master Gardeners Program for Baltimore City Gardens. 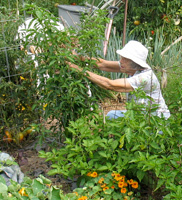 If you are interested in joining a Baltimore community garden, CLICK HERE for more information from the Community Greening Resource Network presented by Baltimore Parks and People Foundation. 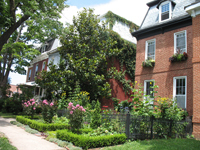 Below are some images from around Baltimore City where other urban gardeners have come up with creative ways to incorporate an oasis in an otherwise inhospitable place. For those who own a home that is surrounded by concrete, I encourage them to chop it up. I mean, make sure it is legal of course, but by removing some concrete and installing a garden, you will not only make a more lively environment next to your home, but you will help save our local waterways. An area with a watertight surface, like concrete, prevents rainwater from naturally soaking into the ground. Rainwater collects debris, chemicals and pollutants and carries them straight to the bay if unfiltered. When I finally purchased a home, I did not have nearly as much green space as I do now. 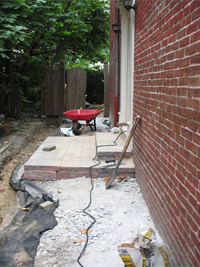 In addition to a concrete pad in the back, the entire side of my house was concrete. I dug up the concrete path which revealed an older brick walkway underneath. I used the surprise bricks in my new design. Look below for a before and after shot of my sidewalk. Happy gardening. In our modern world a throw away culture has unfortunately developed, surprisingly applying to all areas of life, including the garden. A lot of yards today are planted to capacity in spring and summer with the brightest, most colorful and cheapest garden stock available and then often left to die out when the main event has past. These gardens must be replanted year after year and can end up costing a homeowner a lot of money over time. For my Mid-Atlantic friends who wish to break from this uneconomical pattern without sacrificing garden character, I offer some perennial alternatives that will have your yard in a perpetual state of bloom and color, require less water, and cost you less because you will only purchase the plants once. Tulips have become ubiquitous with spring, but I recommend using daffodils instead. Although labeled as perennial, most tulips are so overbred that they will only come up for a few years before they die out. Additionally tulips are also tasty treats for animals and can attract unwanted diners. On the contrary, garden pests generally dislike daffodils and daffodils come in a wide range of shapes and colors. Most varieties of daffodils tend to naturalize and spread out, making them a great garden investment, and some daffodils are even fragrant -an added bonus. Most area summertime flowerbeds display begonias, impatiens, and petunias with the occasional adventure into perennial beds of black-eyed Susans and butterfly bushes. Instead, I recommend Crapemyrtle, Heleanthus and perennial Hibiscus. –Crapemyrtles come in endless sizes and colors range from white, pink and burgundy to “Ravens” purple. For large crapemyrtles, I suggest the Witcomb series, in particular, Rhapsody in Pink®, which grows, on average, to 12ft. Even when not in bloom, Rhapsody in Pink® will continue to garner attention with its attractive burgundy foliage. Interesting smaller crapemeyrtles can be found in the dwarf Filli series. Some of these petite varieties top out at beach ball size and their vibrant color is especially eye-catching. –Helianthus, a North American native plant, is another great choice for summer color. While annuals have a tendency to appear their weakest under the blazing summer heat, bright yellow perennial Helianthus stands tall and bright. –Hibiscus coccineus is yet another great choice for a perennial summer bloomer. It has striking large red flowers that appear more tropical than perennial and deceiving cannabis looking foliage. Like cannabis, this Hibiscus can grow very tall (7ft) and until it blooms, it may have your neighbors doing a double-take. For fall you can create a winning autumn ensemble with Colchicum and Saffron Crocus bulbs, Sternbergia, Little Joe Eupatorium, and native plant Vernonia. –Colchicum is a purple to pink to white fall blooming bulb (actually a corm) that is especially striking when planted in bunches. The root has medicinal purposes, but be careful before using it, as the stem and flower are poisonous. 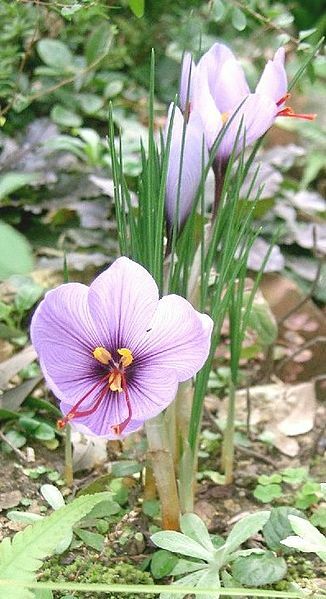 –Saffron Crocus is great for both its rich purple color and use as a herb. The bulbs can be purchased for fairly reasonably by mail order, CLICK HERE. –Sternbergia are bulbs that produce yellow crocus-like flowers that are actually referred to as the “winter daffodil” as they are closely related to the Narcissus family of plants. Sternbergia are actually quite rare in nature and it is illegal to collect them from the wild. –Eupatorium “Little Joe” or Little Joe Pie Weed is a native plant whose flowers attract butterflies. This ‘dwarf’ Joe Pie Weed grows to only 4 feet and displays cluster of pink flowers. –Vernonia is another U.S. Native plant and a great fall bloomer. It has bright purple flowers that make a great cut plant and also works well in fall arrangements and wreaths. In winter there are few gardens illustrating life and color so you are sure to impress with an assortment of Cyclamen, Hellebores and Yuletide Camellia. –Hardy Cyclamen are tubers with delicate flowers that bloom in winter or very early spring in white, pink or purple. The flowers are small, but they have a unique shape and the leaves have silver markings that differ from plant to plant. –Hellebores, or Lenten Rose, are reliable winter bloomers and are generally easy to grow. Hellebores come in a wide variety of colors and forms and will grow happily in shaded areas and in well-drained soil. –Yuletide Camellia has stunning red blooms and are the perfect accent plant for the winter garden and the holidays. Camellia can be grown as a shrub or espaliered like a rose. Planting a base garden with the suggested above flowers can be done all at once or implemented over time. Summer is a great time to start planning your design while looking to fall when temperatures are cooler to do your planting. If you are especially concerned about cost, look for the plants at your local garden center that are not in bloom, as they may be on sale. By planning ahead you will not only save money, but by avoiding buying only what you in bloom, you will save yourself from having a lackluster garden at other times of year. Finally, know that while the plants may seem small in the beginning, a lot can change in a relatively small period of time. Have patience! Rain barrels are one of the hottest things to hit the gardening world. Despite the fact that the concept of water run-off collection has been around a very long time, it has only come into vogue in the western world fairly recently. Although installing a rain barrel is a project I support, there are few things to consider before plopping that giant bucket under your gutters. What kind of rain barrels should I get? There are many different types of rain barrels available, but since used barrels are readily available, I recommend purchasing or making one from a recycled product. When looking for my rain barrels, I took the overall appearance into consideration because the locations of the barrels are easily viewable by my neighbors. I chose two old transformed wooden whisky barrels which I purchased online. A downfall of my wooden barrels is that they must remain moist. The first year I installed my rain barrels the summer was incredibly dry, the wood shrunk and the barrels leaked. After the mini-drought was over, however, they have not leaked since. Recycled plastic rain barrels are also readily available in our area. Just the other day, I saw recycled food rain barrels at Whole Foods in Mt Washington in Baltimore for $99. If you buy a plastic barrel, make sure you get a plastic container that won’t let in light —translucent barrels can speed the growth of algae. You can also make your own rain barrel. Classes are available with Baltimore Parks and People Foundation. The next Rain Barrel Construction Workshop is Monday, June 8, 6-8pm at the Parks & People Foundation location in the Steiff Silver building. For $60 materials, instructions, and assistance will be provided. RSVP to Sabrina Hudson at 410-448-5663, ext. 111 or sabrina.hudson@parksandpeople.org. 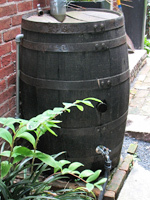 If you want to make a DIY rain barrel, CLICK HERE for an instruction sheet from the Maryland Department of Natural Resources. Installing your rain barrel is relatively easy and should only take a few hours. You will probably have to cut your downspout and may be required to buy an extra part or two. To figure out what you will need and how to install you barrel, I have found a little hokey, but very helpful 4 minute video on installing a rain barrel on You Tube. You will need to drain your rain barrel on a regular basis to prevent mosquitoes and algae build-up, which can clog your pipes. I have my rain barrels attached to soaker hoses, so I can drain the barrels and water the garden automatically. If mosquitoes are a known issue where you live, you may also want to buy Mosquito Donuts, which are all natural rings containing slow release larvicide that will kill larvae before they can mature. A little discussed issue with rain barrels, but a common problem, is overflow. During consistent rains over long periods of time your barrels will likely fill and overflow. The small pipe that you have installed to lead access water away will simply not be enough to control the downfall. There is a reason that gutters and pipes take water away from the house and you need to take this into consideration so you do not end up swimming in your basement. Generally, building a dirt slope that grades away from the barrel and house can solve this issue. This will help move water away and prevent it from pooling around the base of the barrel. If you find that overflow is still a problem, consider splicing your drainpipe and allowing a portion of the water to continue to drain away from the house.